Director's Dish: What Should I Expect? Recently, a friend of mine asked me about resources for a friend who is caring for his wife with younger-onset Alzheimer's. My friend related all of the things his friend is facing - when should I retire? When can she no longer be alone? What can I do to keep her safe? My friend could tell his friend was feeling lonely, exasperated and exhausted. He said to my friend, I just don't know what to expect, and I don't know what I need to do next. This is my ultimate heartache - what keeps me up at night. The thought that there are people who don't know about our resources and support. The thought that families are out there facing this disease alone. So, I thought I would share a brief description of our Care Consultation program in hopes that you will share this amazing, valuable and FREE resource with your friends, family, church family, co-workers, Facebook friends - EVERYONE! Care Consultations can be over the phone or in person, and can involve one person or an entire family. We have even conferenced in family members from across the country. Care Consultations help you and your family understand the disease and what to expect. Most importantly, care consultations can help you plan and know what to prepare for as the disease progresses. We often help families come to a consensus around care plans and how to best care for a loved one. While we wish we had a magic wand to fix all problems, we can provide tools and knowledge. And most importantly an understanding and supportive listening ear. Free and confidential, you can make an appointment or just simply give us a call at 800.272.3900. Please, always know - you are not alone. Our Parkersburg and Morgantown offices will be closed on Tuesday, November 19. Our staff will be at our Charleston office for our November all staff meeting. Next week our offices will be closed on Wednesday, Thursday and Friday in celebration of Thanksgiving. However, our 24/7 Helpline (800.272.3900) will be available throughout the holiday! Stay tuned to our Community Calendar this week, we will be posting a whole list of Community Workshops for the upcoming months. LGBT Outreach Project: We are in the planning stages of an outreach project specifically targeted at LGBT caregivers and building awareness about Alzheimer's and dementia and available resources within the LGBT community. The tools developed will be a part of a national toolkit. We are working to get a baseline through a survey and would greatly appreciate your help distributing the survey. Click here for a link to the survey. I am a home-made popcorn addict. I will pass on the movie uber buttered junk any day, but put me in front of a homemade bowl - it will be gone in an instant. 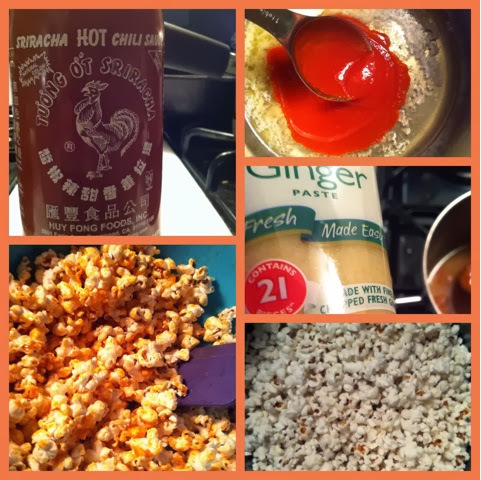 I had some left over popcorn from a batch of caramel popcorn I made for our tailgate a few weeks ago - and just happened to run across this recipe. Who doesn't love Sriracha, the controversial chili sauce that goes with everything! I do feel slightly guilty eating it, I feel for all of those citizens who live near the Sriracha plant...but.... Not to mention if ever forced to choose, W would for sure choose Sriracha over me. The recipe I found called for 4 cups of popcorn, but I would say closer to 8 or 10 cups. You want enough popcorn so the sauce evenly coats the popcorn without making it soggy. My other piece of advice, don't put the caramel popcorn in the same basket as the Sriracha popcorn. Our friend grabbed a giant handful and popped it in her mouth without looking...it wasn't pretty! In a large pot over medium heat pour in a tbs of oil and add 3 kernels of corn. As soon as the kernels begin to pop, pour in 1/3 cup of kernels. Cover and keep the kernels moving across the bottom until all of the popcorn is popped. This produces 4 cups of popcorn. Repeat process to make 8 cups. In a sauce pan melt the butter in olive oil over medium heat. As soon as the butter melts add the rest of the ingredients and cook until all ingredients are incorporated. Pour over popcorn and mix well! You want to make sure the sauce coats the popcorn evenly and there aren't any soggy pieces at the bottom. Enjoy with a cold beverage to cool your soon to be on fire mouth!